You've seen them on everyone doing everything, but what kind of quality do you get from such a small package? The GoPro Hero 3 (not even the Hero3+) is one amazing piece of camera equipment. I have had it for a while, but this will be my first winter season with the camera, and winter is what I bought it for. So with the awesome opening day at Big White Ski Resort in the Okanagan, I caught a few clips with the camera that I will share with you now. 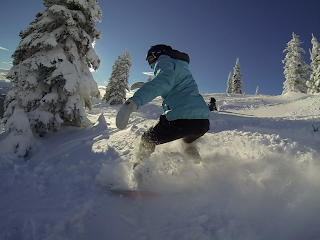 First, about the GoPro I was using - HD, but getting good performance in snow was challenging. As if the auto exposure was built to top out at exactly what they thought the brightest possible scenario is. This GoPro Hero3 however blew me away once I saw images on a computer screen. I was shooting this day in 1440 resolution, which for those who don't understand, it is similar to 1920x1080, in that the width is 1920 pixels, but there is actually another 300 something up top for more of a full frame aspect ratio. This was not shot with 'prores' feature either (I am using a GoPro Black though). I used 48fps to make use of bright conditions and freeze action, at expense of data to be stored. People don't really watch things in 4:3, everything is 16x9, so the benefit to shooting this way is the wider view, giving you space to pan and crop vertically in your video if need be - which in the case of snowboarding, to capture sky above, landscape in front, and what your board is doing below, you need to shoot in 4:3 essentially. So, despite there being a Hero3+ out right now, its hardly necessary with all the power built into the Hero3, if you just want to capture some of the great times you have.